For thousands and thousands of years, Noongars gathered in BunGeo to hunt and celebrate. A few centuries ago the Dutch, French, British and Americans discovered the shores of Geographe Bay and the fertile land beyond. Many stayed and prospered. Aboriginal people from the South West, known as Noongars, have gathered in the area that is now Bunbury for about 45,000 years. For them, the area was a seasonal gathering place, with good sources of food, and sites for ceremonial gatherings. The first Europeans to sail up the west coast near Bunbury were the Dutch in 1658 on the Elburg, who were duly followed by the British and the French. In 1803, the area that would eventually become Bunbury and Australind was investigated by a group of French explorers led by Captains Baudin and de Freycinet. The expedition had left Le Havre, France two years earlier on their ships the Geographe and the Casuarina, for which the respective bay and point were named. The Geographe’s botanist, Jean Baptiste Louis Claude Theodore Leschenault de la Tour, was among the first of the sailors to venture to shore. Leschenault Inlet is named in his honour. Koombana Bay was originally named Port des Barques (port of the small boats) by Baudin. In 1829, a British survey party from the Swan River sailed down the coast. The expedition leaders, Dr Collie and Lieutenant Preston (for whom the Collie and Preston rivers were named), both reported favourably on the area and the following year the colony’s Surveyor General, John Septimus Roe, explored the region. The hills in the region are known as the Roe Range, in honour of the colony’s surveyor general, and the town of Roelands was named after a nearby farm originally belonging to John Roe. The first area in the region to be settled was Harvey. 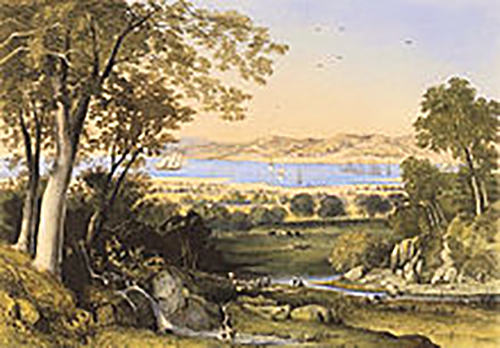 In 1829, Captain James Stirling (later to become the first Governor of Western Australia) selected a quota of fertile land and called it the Harvey River Settlement. In the 1830s, it was Lt Henry Bunbury who mapped the arduous and difficult inland route to the area from Pinjarra. The settlement was named Bunbury in honour of the lieutenant’s work forging the route. Central Bunbury was officially surveyed in 1840 and the first magistrate was appointed in George Elliot, later replaced by William Pearce Clifton. It was Clifton who built the iconic Leschenault Homestead on the inlet, using predominantly timber, wattle lathes and mud. Other arrivals include the Little Family, as agents of CR Prinsep of Calcutta, to breed horses for the British Army in India. The settlement was named Australind, the name abbreviated from Australia and India. The experiment was fraught with difficulty and by 1843 it failed. However, the Clifton’s and several other pioneer families struggled through the early years and survived to be counted amongst Western Australia’s most prominent and enduring colonial families. Bunbury prospered as whalers would anchor along the foreshore. The also port grew from the export of hardwood (Karri and Jarrah) timber, which was milled in the hinterland. The world’s rapidly expanding rail network, including the London Underground, was desperate for Jarrah sleepers shipped from Bunbury. 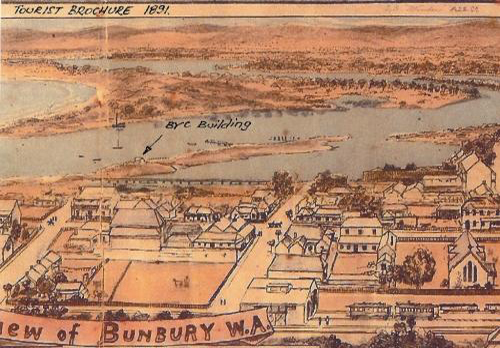 Bunbury became a municipality in 1871. Railway lines were constructed to Perth and Boyanup in the 1890s, which increased the port’s already significant operations. Around this time the town acquired a reputation as ‘The Brighton of the Colony’. It became a pleasant seaside resort for miners flush with gold from the eastern goldfields. Guesthouses, hotels and new baths were built to meet a blossoming demand for accommodation. The Capel River was discovered by Frederick Ludlow in 1834 but was not named until the famous Bussell family settled in the region. The name honours Capel Carter Brockman, a daughter of John Bussell. In the 1830s a number of settlers followed the Bussell’s into the area, including the first two Governors of Western Australia, James Stirling and John Hutt. The town of Capel was surveyed in the 1870s, with the first land lots sold in 1897. Originally, the town took its Noongar name – Coolingnup. It was changed to Capel in 1899. Donnybrook takes its name from the town in Ireland. In 1842, a group of five Irishmen with four servants, arrived in the district intending to establish farms on the 130 ha they had been granted. The farms were short lived. The men tried their luck with horses, cattle and sheep but all failed and they abandoned their settlement by February 1843. By 1868, the Anchor & Hope Inn was licensed and providing accommodation for travellers through the area but Donnybrook remained a very tiny settlement. It changed when Richard Hunter found gold in the area in 1897 and the goldfield was officially gazetted. Though the rush was brief, a new hotel had been built, land prices had boomed and the population of the town had leapt as prospectors and miners arrived to try their luck on the fields. The town was gazetted in 1894. The first Granny Smith apple tree was planted in 1900 but the apple industry didn’t really get started until after the Great War. A man named George Parke was the first orchardist to plant apples commercially in the area. Today Donnybrook is the largest apple producing area in Western Australia. Little is known of the history of the Balingup area pre-European settlement, other than that the name ”Balingup” is an alleged corruption of an Aboriginal name – Balingan, a noted Noongar warrior said to have been born in the district. The first European explorers traversed the area in 1842 on an expedition to find an overland route from the colony at Albany on the South Coast to the colony at Vasse on the West Coast. The expedition came across the Blackwood River at Southampton and Wrights Bridge. Richard Jones took up 10 acres in 1854, building a mud brick homestead “Southampton”. Others followed and Balingup was declared a township in 1898. The orchard industry became established in Balingup in 1895 when a Swiss nurseryman named Jacob Hawter established what was then the largest orchard in the State. He also created the first purpose-built cool store in the state. Progressive farming methods and the introduction of improved pastures, superphosphate and subterranean clover saw dairy farming become the major rural industry in the district, and in 1933 a cheese factory was established. The area was first settled in 1854 by Commodore Scott, who built his homestead ‘Norlup’ at Scotts Brook south of the town. Commodore Scott was followed in 1861 by Sir James George Lee Steere, who settled near the Blackwood River. Although the name Throssell (after the presiding Minister for Lands) was used for a short time, Sir James Lee Steere suggested the Aboriginal name Boyup (Booyup), meaning Place of Big Stones of Big Smoke (from the burning of Grasstrees on the Blackwood River), should be used. The townsite was gazetted as Boyup in 1900. In 1909 to avoid confusion with the similarity of Boyup and Boyanup, the townsite was renamed Boyup Brook. The first major building was the school – opened on the 9th February 1900. By 1909, a railway line from Donnybrook had reached the settlement, making Boyup Brook more accessible and recognised. In 1940, during the Second World War a flax mill was built in the town. This was built to meet wartime demands for flax to send to Europe. The flax mill was the last flax mill in Australia to close down in the 1960s. Collie was named after Dr Alexander Collie RN, a ship’s surgeon aboard the HMS Sulphur, who explored the region and in 1829 discovered the river from which Collie took its name. The area was originally recognised as being ideal for pasturelands and timber production. However, with the discovery of coal in 1883, Collie’s direction was set. The town was formally declared a townsite in 1896 and from its humble beginnings, Collie grew to become an important West Australian town supplying the State with coal, the all-important resource for power production in railways, shipping and the generation of electricity.